Mast-o Khiar is a wonderfully, cool and refreshing side dish to serve with Persian khoresht and rice. This dish is traditional in many middle eastern countries, and here is the Persian version. Dice cucumbers finely and drain in a colander to remove excess liquid. Place the yoghurt in a bowl, and stir the cucumber through. 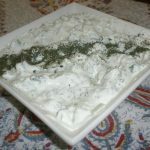 Finely crush the dried mint in the palm of your hand, or in a pestal and mortor, and stir into the yoghurt.